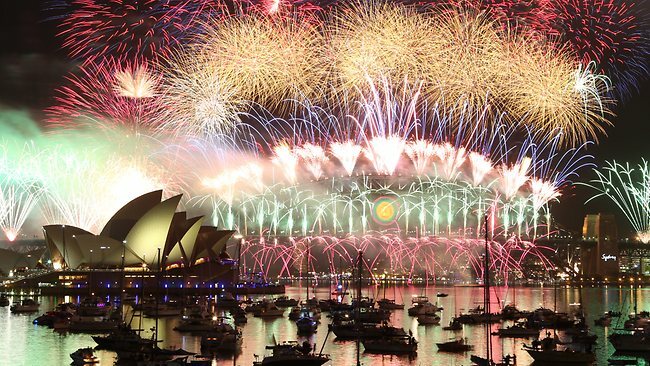 Wow, if there’s ever a good place to see in the New Year, Sydney’s got to be right up there with it!! The city’s busy but not so much as to get jostled; everyone gets a good view of the proceedings and all of the proceedings are in one good view. It’s fairly perfect – oh, and it’s T-Shirt weather too. Compare this to sub-zero Yorkshire, England avoiding lairy would-be-kissers, beer drenched clothes and foot-treading aplenty…I think I know where I’d like to be! Anyway, the featured area of this article is South East Asia. 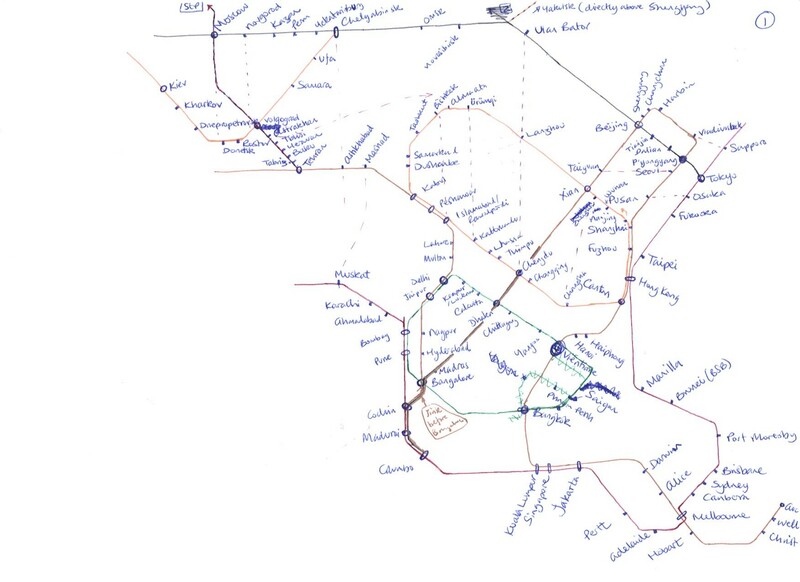 I’d pondered getting straight to work on Europe, but being a European I figured (rightly as it turned out) that that Continent would be the easiest to define as an underground map. Better save that to last then – especially seeing as I was looking forward to doing that bit the most. Here’s the South East Asia sketch. 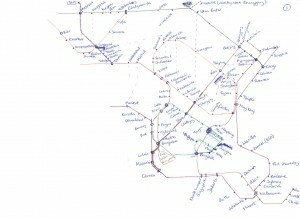 As with all the areas of the world (yes, even Europe), it took hours and hours of trial and error and atlas scanning before I was happy with the end result.This isn’t the sketch that was produced on the plane from Auckland to Sydney, but it was this area that was featured – in a much rougher format at that time. Back in Sydney, and England were fiddled out of the Fifth Test as Steve Waugh was out around three times before the umpire finally gave him out. The Aussies were in a bit of a panic as Andy Caddick and Steve Harmison set about them, but they scraped home in the end to put the seal on a good old fashioned drubbing. Still, Sydney’s a nice place!! More incursions into Asia next time.